The so called Visual Production Scheduler (VPS) is an add-in for the role-tailored client versions of Microsoft Dynamics NAV. The VPS visualizes manufacturing data as Gantt chart planning boards. Recently, the version 1.3 of this add-in had been released. In this blog post, you can learn how to visualize the material availability as graphical BOM with the Visual Production Scheduler. The Visual Production Scheduler complements production scheduling within Microsoft Dynamics NAV by visualizing production orders, production order lines, operations, resources and capacity utilization. It enables the production planner to easily change the schedule with drag & drop. As a Gantt chart add-in (rather than an add-on), the VPS is fully integrated into NAV so that all data remain in the ERP system, users are less vulnerable to data losses and database updates can happen rather fast. With the new version, a Dynamics NAV manufacturing user also gets a tree chart view of the bill-of-material (BOM). This new view visualizes for each top-level item the structure of components and semi-finished goods with their own subassemblies. The new BOM view also shows the quantity of the needed items per production order / production order line in relation to the available quantities. As such, the planner can see at one glance if there is enough material available to start with the production order in time. Missing quantities of components and subassemblies are marked red so that the user can take immediate action: either order or produce missing material, or postpone the delivery of the production order. Are you familiar with the following scenario? The production schedule is released, capacity utilization is high and all processes are running smooth ... when a customer calls and asks if you can finish his production order two days earlier. In that case, you can open the visual BOM from the VPS and check the material availability not only for the planned start date of this production order. You also can check the availability at other dates by changing the demand date with a date picker. When committing the date change, the visual BOM immediately simulates the material availability for that specific production order at the new demand date, and updates automatically. Hence, the planner immediately sees if he can start earlier or not. In the latter case, he also sees the missing components and subassemblies and can take further actions accordingly. 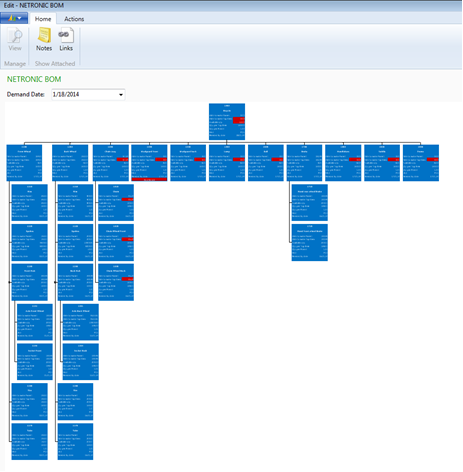 Starting with the second hierarchy level, the planner can collapse and expand individual trees of the visual BOM. This helps him to quickly switch between high-level and detailed information. provides information about available and missing quantities. These data fields are used to create the visual BOM as part of the Visual Production Scheduler. The required quantities per production order are calculated and compared with available and able to make quantities. Hence, the visual BOM identifies component by component if the available quantities are sufficient or not to finish the respective production order in time. Missing quantities are highlighted in red. Especially short-term changes to the production schedule require transparent information about the material availability, about capacity bottlenecks and delivery time conflicts. The visual BOM provides immediate insight into the material availability and hence plays a crucial role supporting the production planner. Do you want to learn more about the visual BOM for Microsoft Dynamics NAV? Let's schedule an online meeting so that we can learn more about your challenges and your customers' requirements. We also would use this meeting to share with you more information about the Visual Production Scheduler add-in including the visual BOM.